I’m all about increasing our veggie consumption without having to try too hard. So that’s why I love this twist on one of our most favorite family meals – Spaghetti and Meatballs! Now we’re all about our regular meatballs made with meat, but just to switch things up (and make sure we get a good dose of veggies!) we’re loving this new zucchini version as well. I hope your family enjoys it just as much as mine did. Preheat the oven to 425 degrees F. Grease a large baking sheet with oil. Cut the mozzarella into 12 equal sized square pieces and set aside. Shred zucchinis using a food processor or hand cheese grater. Use a clean kitchen towel to wrap up the shredded zucchini and squeeze as much liquid as you can out of it (and discard). In a large bowl mix together the shredded zucchini, eggs, breadcrumbs, Parmesan, basil, garlic, and salt until well combined. It's time to form the "meatballs." 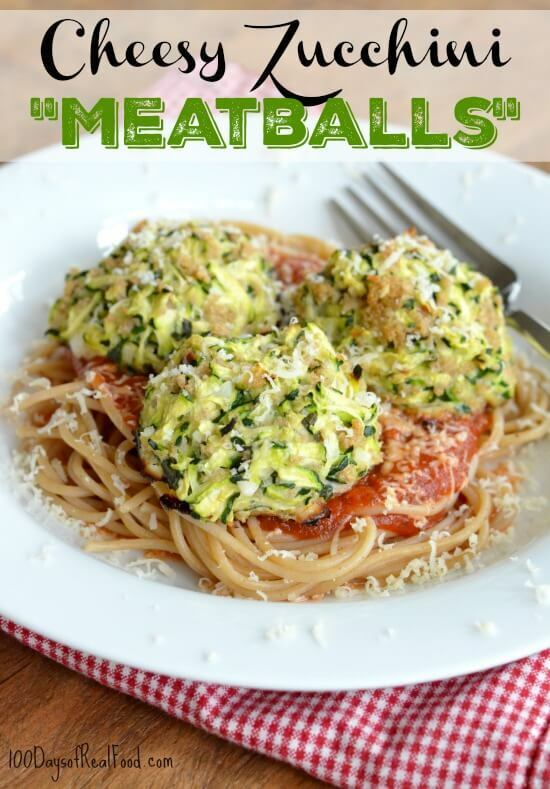 Take a handful of the zucchini mixture, shove one of the mozzarella squares in the middle, then form it into a "meatball" with the mozzarella completely covered on the inside. Squeeze the "meatball" together tightly and discard any additional excess liquid. Repeat with remaining ingredients and place on the greased baking sheet. Bake for 14 to 16 minutes or until golden brown on the bottom. Serve warm over noodles with red sauce and (if desired) garnish with additional Parmesan cheese. Enjoy! Previous Post: « Packaged Real Food? Oh my, these look amazing! I don’t eat meat and am always looking for fun ways to make favorite Italian dishes I grew up on. Lisa, so refreshing to hear that YOU struggle with getting enough veggies in your families diets as well. I’ve taken to serving sides of veggies with pancakes and waffles just to get more veggies in our meal. I constantly strive to keep half our our plate veggies, unfortunately, veggies just don’t fill my girls up as well as carbs, so they are usually still hungry:( Can’t wait to try the meatballs, perfect meal for Lent. Did you use dry breadcrumbs or fresh? I made my own fresh breadcrumbs, squeezed the zucchini and weighed out the cheese (didn’t end up using it all), followed all the directions except I lined my pan with parchment paper to avoid sticking. Unfortunately, the cheese melted out of my meatballs and they deflated and lost their shape. Fine for us, but wouldn’t serve them to company, any tips? Still tasted delicious, at least to my husband, myself and my youngest daughter. My picky middle daughter didn’t care for them and my oldest asked if I could make them without the zucchini next time. Lisa, so refreshing to hear that you have trouble getting enough veggies into your families diet. I have taken to serving a side of veggies with pancakes and waffles in an effort to get more veggies in. I strive to have half our dinner plate be vegetables. Trouble is, veggies don’t fill my kids up as much as carbs do, so they usually ask for seconds of the main dish, biscuits, corn bread, etc:( I can’t wait to try the zucchini meatballs. They are perfect for lent. Looks so yummy. I don’t think I’ll call them meatballs though. I might get mauled at the dinner table! 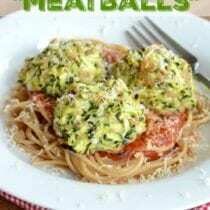 This is a great-looking twist on spaghetti and meatballs, and is equally a twist on the trendy take of spiralised courgette/zucchini ‘spaghetti’ ribbons. I’m very intrigued and will try it out! these look like perfect appetizers with some marinara! thanks! No one in my family likes zucchini so I am always looking for recipes to try and see if I can sneak it in. I’m excited to try this one and see what everyone thinks. Looks yummy! I am all for sneaking in vegetables whenever possible. Did your kids like it? I have some picky eaters, so I am always looking for kid-friendly healthy recipes. Hi, May I ask where you get your organic cheese from? I always get it from costco – The Clover’s organic blend, shredded one. I do not see a better place that sells better/less expensive organic cheese around. There is whole foods and sprouts nearby my home though. Your suggestions will be really useful. Hi. Lisa typically buys Organic Valley from Earth Fare. can you tell what the nutritional values are for the recipes? Hi there. We do not provide nutrition details. This might help explain why: https://www.100daysofrealfood.com/2013/01/04/healthy-eating-defined/. I found these to be really good. My husband even liked them which was a bonus! When I told him what I was making for dinner he looked at me like I was crazy, but he loved them and asks for them all the time now. Made these today and… ate them all by myself. I have been making them in a similar way for many years but fried them instead. Baking them is a much better way! I love this recepie and wouldn’t change a thing about it. Each zucchini is about a cup.